German food is not really something I’d ever eat at home, so while in Berlin it made sense to sample some traditional cuisine. Clearly a country with excellent taste, the Germans seem to share my fondness for offal, with calf’s livers and pig’s kidneys featuring on many traditional menus, along with some absolutely incredible mashed potatoes and an awful lot of cabbage. This food is really quite delicious but not something I, or indeed many people could eat every day. Just as well, then, that Berlin is absolutely heaving with different cuisines from all over the world…even better that many of them are conveniently packed into the glorious Thursday Night Food Market. The creators of this Thursday evening market describe it as ‘edible proof that Berlin is a center of culinary creativity, a melting pot whose diversity is visible in its multitude of authentic food cultures’. 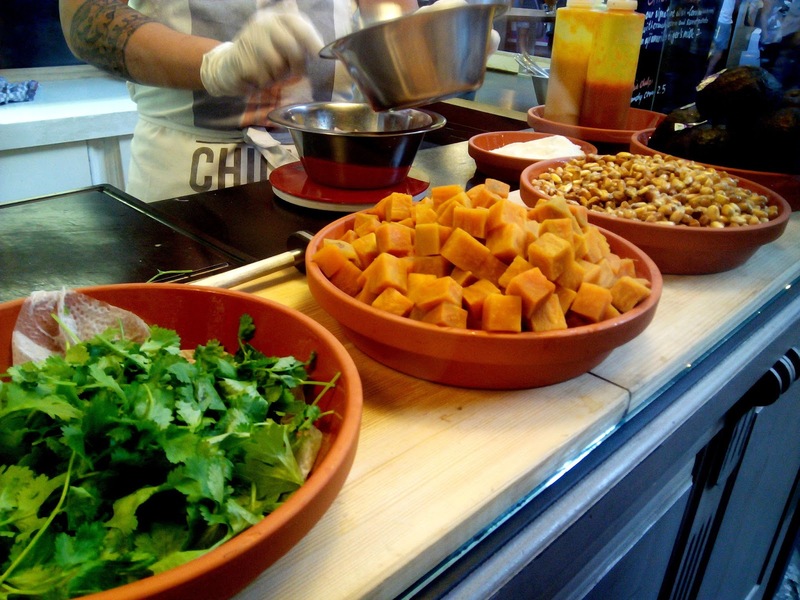 With an eclectic mix of cuisines from all over the world including vegan Egyptian food, Brazilian tapioca pancakes, as well as tempting French sweet treats and some brilliant looking Belgium waffles, I would have to agree! 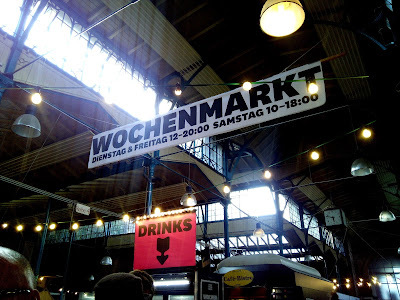 Held in the market hall on Eisenbahnstraße in Kreuzberg, this event runs every Thursday from 5pm-11pm. My mum and I ensured we arrived hungry so as to be able to sample a little bit of everything (you have to have a game plan with these sorts of things, you know). Not quite knowing where to begin, our eyes were drawn to this Peruvian pop-up, Chicha. Offering ceviches of salmon and corvina, a white fish found frequently in South America, this fresh fish dish was just calling out as the perfect starter to a lot of food ahead. Sweet and soft chunks of cooked yam combined with salty, crunchy popped corn as the perfect accompaniment for the fresh raw salmon. Bathed in lime juice and scattered with red onions and coriander, the salmon ceviche we ordered was a party of flavors in a plastic bowl. Brilliantly balanced, each element of the dish perfectly complemented the other. 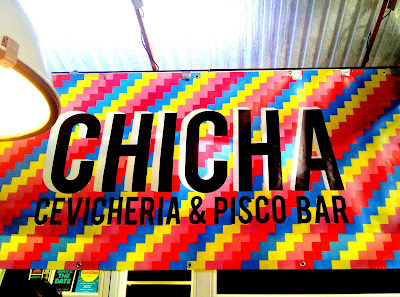 Tragically, they couldn’t actually offer any Pisco (a dangerously drinkable grape brandy produced in Chile and Peru) as they hadn’t got their license. 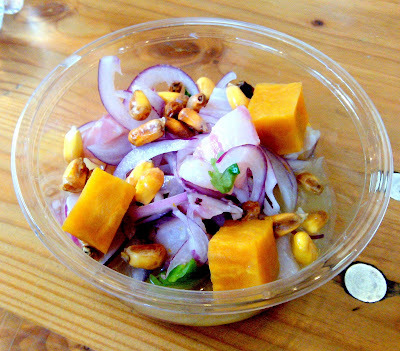 We survived all the same, and despite wanting to sample some more of this incredible ceviche, we saved room for what was ahead. 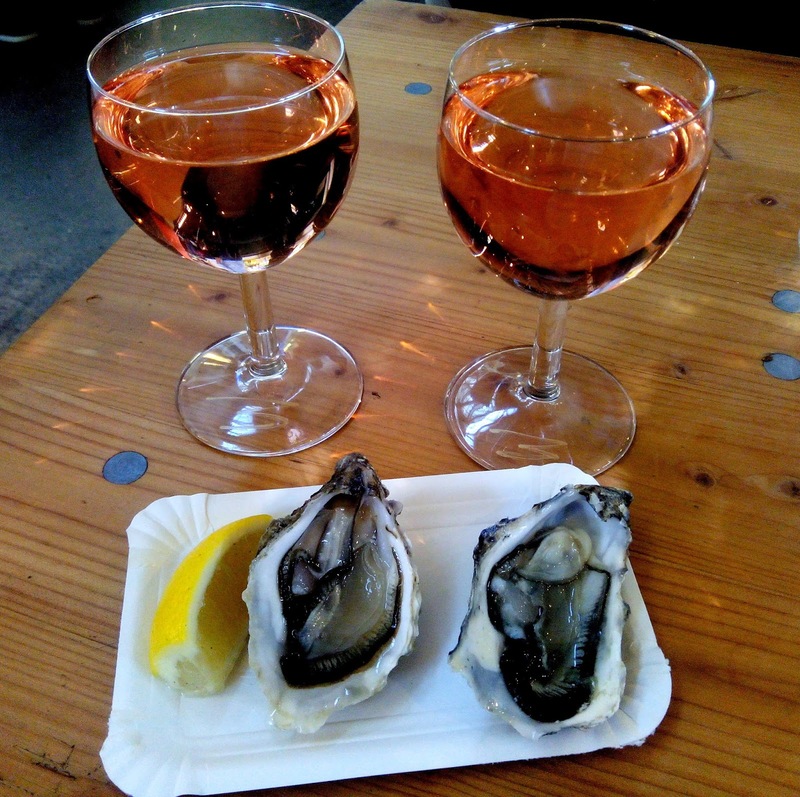 Initially, it was our desire for an alcoholic drink which led us to a French champagne and oyster bar, where we ordered two (rather large) glasses of rosé wine. Seeing everyone around us slurp on their oysters made us think we should probably order a couple – I’d never tried them either, and was keen to see what they’d be like. I picked the oyster away from the shell, squeezed over some lemon and was ready to be blown away. Oysters are like, dead fancy and expensive right? Therefore, they must be delicious. I’m not sure if it was just a particularly underwhelming type of oyster, but I was left rather indifferent to this slimy shellfish. Still glad to have tried it anyway, at least the rosé went down a treat. Oysters slurped and wine swallowed, it was onto the next foodie station. Food trends are funny. One minute we’re all going mad for pulled pork, the next it’s crazy pastry hybrids (hello, cronut)…what is it that makes one particular cuisine or dish so sought after? 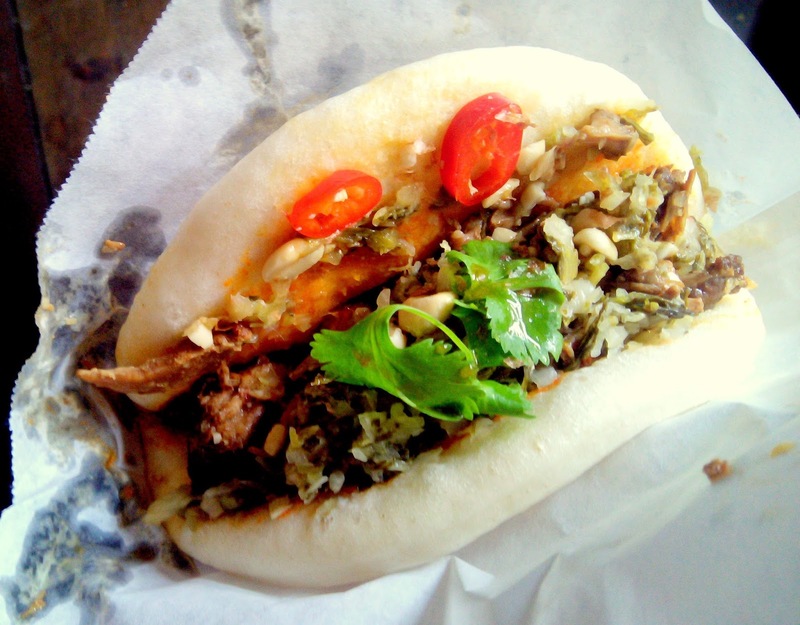 Without a doubt, the latest food trend to hit us in a huge way is Gua Bao, steamed Taiwanese buns. The mixture of the perfectly plump steamed buns, slow cooked pork belly, pickled greens and fresh coria nder, topped with sugary ground peanuts is pretty damn delicious and means that this dish has more than earned its trendy foodie points. 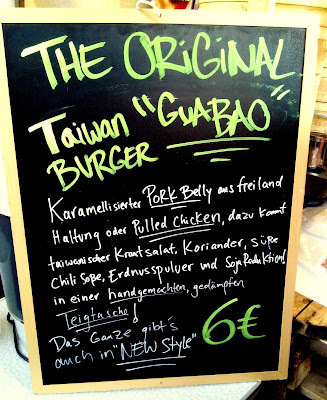 Berlin being as on-trend as any city I’ve ever visited before, I was unsurprised to see a Gua Bao stand at the Thursday Night Market – and equally unsurprised to see it had the longest line of any of the stands. Some things are worth queuing for, though. My mum suggested just sharing one steamed bun between us. She clearly hadn’t tried this Taiwanese treat before – I assured her she’d be wanting her own. The pulled chicken filling looked good, but as I said to my mum, it’s just not pork belly is it? Barely stopping to take a photo, I ate this Gua Bao in a state of bliss. The fluffy steamed bun is a dream vehicle for all the goodness it contains inside, and with the sprinkle of chilli on top, it had a slight kick to tie in all the flavors together. Finally feeling like we could be full, I explained to my mum that this was only in the savory stomach compartment, and, in fact, there’s always at least 10% room left for sweet. Intrigued by my solid scientific theory, we headed onto desert. My mum opted for a mini cheesecake from the beautiful selection at the French patisserie while I chose a couple of scoops of gelato from the ice-cream stand next door. So good were these deserts, we had consumed them before I had even remembered to take any photos. Must have been the summer heat and one too many glasses of delicious German Riesling wine. Leaving the Thursday Night Market, I was very pleased with Berlin’s foodie fare so far. And the best bit? There’s still more to come! Stay posted for the final installment from BidmeadBites in Berlin, where I sample some very odd savory macaroons and revel in the best food hall ever.